We are back from a week in southern Iceland, which we spent studying one of the great sagas with a small group of storytellers. We also visited places where this thousand year old drama unfolded. 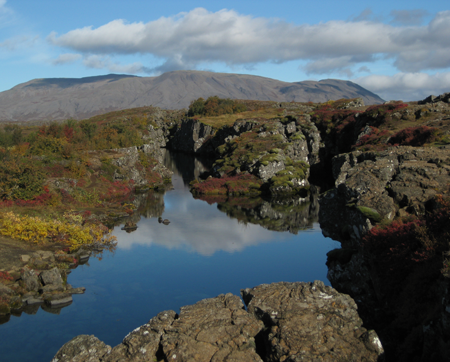 I’ll speak of Njal’s Saga in future posts, but here are a few pictures of the striking Icelandic autumn. 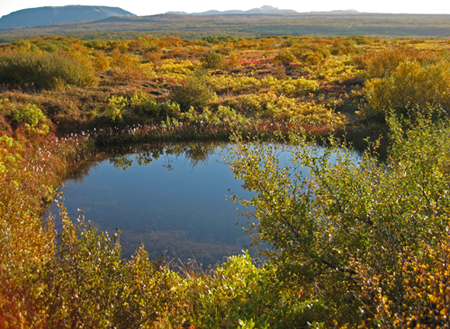 A thousand years of volcanic eruption and cutting trees for heat stripped most of the native birch and willow forests. 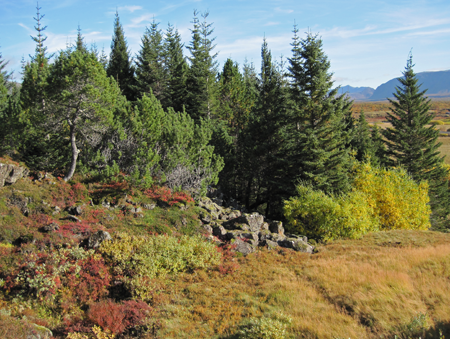 A joke we heard several times is, “If you get lost in a forest in Iceland, stand up.” Reforestation efforts are underway, but meanwhile shrubs and even some of the lichen that covers the boulders provide dramatic fall colors. Pines are not native to Iceland, but this stand, planted by the government at Thingvellir Park, made a welcome spot for a picnic. 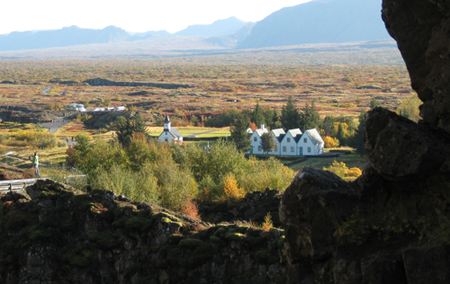 Thingvellir from the cliffs above. The Law Circle, where the National Assembly met every summer, stands behind the church (a later addition). 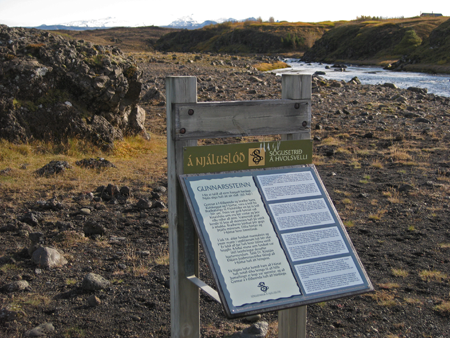 Beginning in 930, the Icelanders’ efforts to govern by rule of law was key to the life of the nation and to Njal’s Saga as well. Gunnar lived and died at a farmstead in Hlidarendi, a name that means “Hill’s end.” This is where the highlands slope down to the coastal plain. The green area with a pine border in the middle ground is Nina’s Grove, a park and sculpture garden in honor of Nina Saemundsson (1892-1965), a world-renowned Icelandic sculptor who was born in Hlidrendi, but also spent 30 years in the US. Her statue, The Spirit of Achievement was placed over the entrance of the Waldorf Astoria hotel in New York. 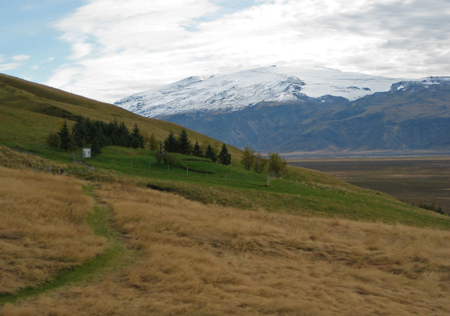 In the distance is Eyjafjallajökull (Icelandic for “Island, mountain, glacier), which erupted in 2010. An explosion of lava blasting through a 700 meter thick glacier created tons of ash that blew toward the continent and stopped European air travel. 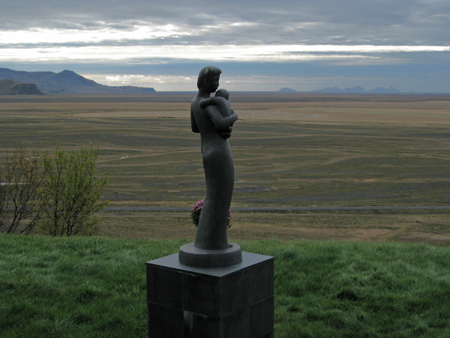 This view over the coastal plains shows a view of Nina Saemundsson’s sculpture of a mother holding two children. 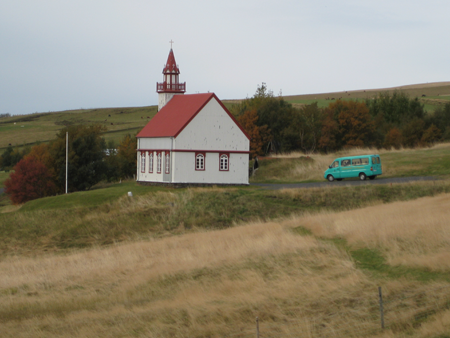 The church at Hlidarendi and a view of the little green van we toured in. Much of the information here came from our driver, who spoke excellent English. He tried to teach us how to pronounce “Eyjafjallajökull,” with little success. This entry was posted in History, Photography, Travel and tagged folklore, history, Iceland, photography, travel. Bookmark the permalink. Stunning, Photos… and I am looking forward to hearing stories from your trip! Thanks JT. I’m finally getting organized enough to get to it. Wonderful photographs and commentary! AN unforgettable visit, no doubt!